Strengthening the connection between school and work will better prepare these workers for the demands of today’s new good jobs. 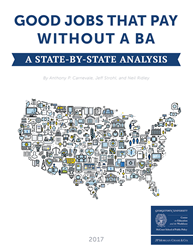 ● Sixteen states plus the District of Columbia have fewer good jobs for workers without B.A.s than they had in 1991. States that were hit hard by manufacturing employment declines were likely to shed good jobs overall. ● States with the most significant blue-collar losses were New York, Pennsylvania, California, Ohio, and Illinois. ● Only two states (Massachusetts and New York) and the District of Columbia shed good jobs in both blue-collar and skilled-services industries. ● Only four states experienced a rising share of good jobs held by workers with no more than a high school diploma. To view the report and interactives, visit http://goodjobsdata.org. JPMorgan Chase & Co. (NYSE: JPM) is a leading global financial services firm with assets of $2.6 trillion and operations worldwide. The Firm is a leader in investment banking, financial services for consumers and small businesses, commercial banking, financial transaction processing, and asset management. A component of the Dow Jones Industrial Average, JPMorgan Chase & Co. serves millions of consumers in the United States and many of the world's most prominent corporate, institutional and government clients under its J.P. Morgan and Chase brands. Information about JPMorgan Chase & Co. is available at http://www.jpmorganchase.com. Follow JPMorgan on Twitter @JPMorgan and Facebook.